Presented in honor of those who served our country. 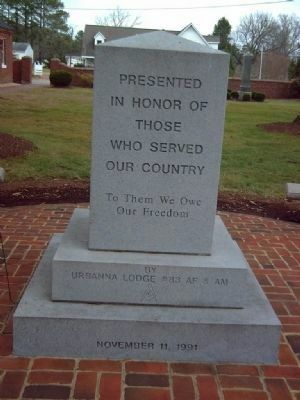 Erected 1991 by Urbanna Lodge #83 AF & AM. Location. 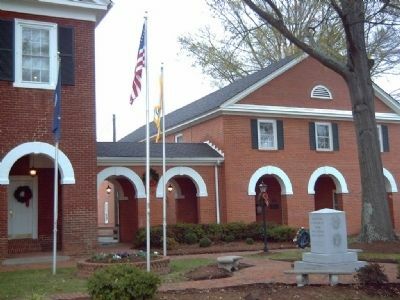 37° 36.382′ N, 76° 35.694′ W. Marker is in Saluda, Virginia, in Middlesex County. Marker is on General Puller Highway (Virginia Route 17) near Gloucester Road (Route 33). Touch for map. 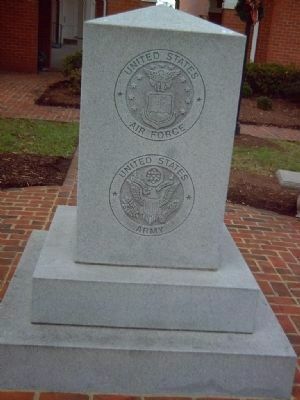 Marker is in this post office area: Saluda VA 23149, United States of America. Touch for directions. Other nearby markers. At least 8 other markers are within 2 miles of this marker, measured as the crow flies. 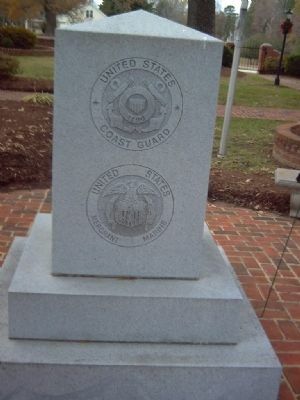 1st Lt Beryl R. Newman (here, next to this marker); Middlesex County Confederate Monument (a few steps from this marker); Middlesex County Courthouse (a few steps from this marker); Morgan v. Virginia (within shouting distance of this marker); Middlesex County / Gloucester County (approx. 1.6 miles away); Scottish Factors Store (approx. 1.6 miles away); Christ Church (approx. 1.6 miles away); Rosegill (approx. 2 miles away). Touch for a list and map of all markers in Saluda. More. 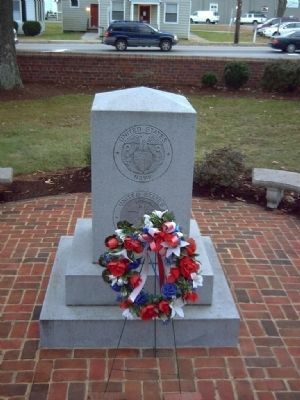 Search the internet for Middlesex County Veteran's Memorial. Credits. This page was last revised on June 16, 2016. This page originally submitted on December 4, 2008, by Kevin W. of Stafford, Virginia. This page has been viewed 632 times since then and 4 times this year. Photos: 1, 2, 3, 4, 5. submitted on December 4, 2008, by Kevin W. of Stafford, Virginia.